Esser® wines are produced from the cool Central Coast Region of California and crafted from sustainably farmed vineyards. These wines express the fruit, the climate, the terroir and water into a poetic expression of flavors long sought by wine connoisseurs from around the globe. 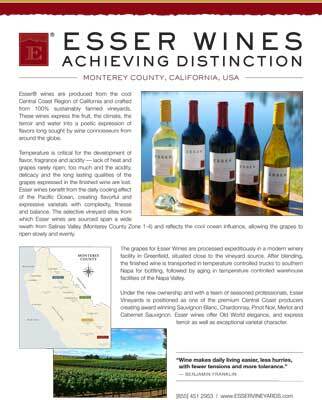 The Esser® Vineyards sell sheet is a two page PDF file containing an overview of Esser® Vineyards and each of the five varietals.